Air Fryer makes cooking quick, convenient and most importantly, healthy! This unique product makes crisp, succulent fried food with little or no oil. Using Rapid hot air convection cooking technologies, the Air Fryer reaches an internal temprature of 200C and evenly circulates hot air to fry with same crunchy exterior as by conventional deep fryers. It can also be used to bake broil meats, vegetables, cake & pizza. 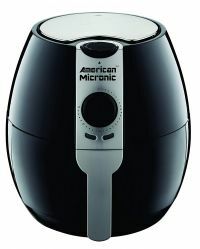 To Recieve updates and possible rewards for American Micronic American Micronic- 3.2 Litre Air Fryer please sign in. To Recieve updates and possible rewards for Air Fryer and Tandoor please sign in.